PEORIA, IL—Citing the man’s wrinkled uniform and detached attitude, Rite Aid patrons surmised Thursday that, if appearances could be believed, it would almost seem as though cashier Gabriel Morales was wholly unconcerned with the reputation and overall corporate health of the third largest retail pharmacy chain in the United States. “I don’t want to jump to conclusions here, but his body language and general behavior might nearly imply that he has little or no regard for the history of the Rite Aid corporation and the image that it wants to project to the world,” said pharmacy customer Michael Valetta of the 39-year-old Rite Aid employee, noting that Morales’ nonexistent greeting, slow response time, and general air of indifference all but pointed to the conclusion that he perhaps did not see himself as a representative of the Rite Aid brand who has been tasked with upholding that company’s sense of tradition and character. 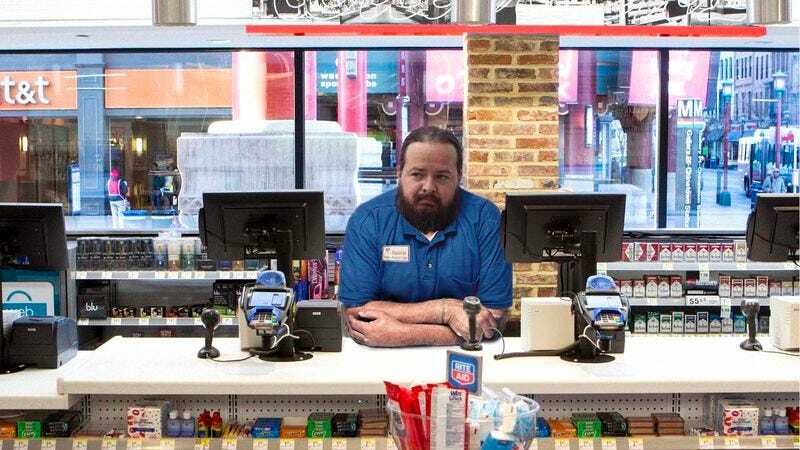 “Honestly, if I didn’t know any better, I’d say he was just treating this job as—how should I put this—well, almost like it were any other minimum wage retail job rather than an esteemed position at one of America’s most beloved, time-honored companies.” At press time, customers were baffled to note Morales smoking outside of the store while on a break, as though he wasn’t the public face of the country’s premier purveyor of pharmacy, health, and wellness services.